The neo-classical Stadtschloss Wiesbaden, or Wiesbaden City Palace, was only completed in 1841, but the site on which it sits represents centuries of influence for the Nassau family. After its completion, the nineteenth-century structure was the primary residence of the Dukes of Nassau. It survived the Revolutions of 1848, as well as the annexation of the Duchy of Nassau by Prussia in 1866. Perhaps more importantly, most of the palace survived both World War I and World War II, although the latter left significant damage. Today, Stadtschloss Wiesbaden is the seat of the Landtag (or State Parliament) of Hesse. 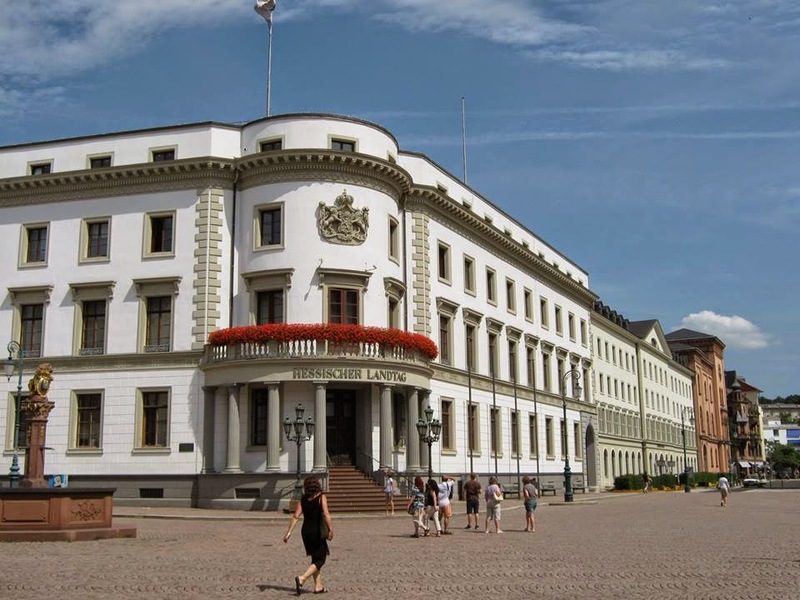 During the Middle Ages, a castle sat on the site that is now Wiesbaden City Palace, and the Counts of Nassau established residency in that city in the year 1236. History records that the Holy Roman Emperor Friedrich II actually celebrated the Feast of Pentecost in the earlier castle. The castle, as well as the city of Wiesbaden, were destroyed after a 1242 conflict between Friedrich II and the pope. This was not the first time Wiesbaden faced destruction, and it would not be the last. In fact, the city was destroyed and reconstructed at least three times during its history. Later devastation would occur during the Thirty Years’ War (1618-1648), by which time Count Philipp III of Nassau-Weilburg had commissioned the New City Palace. History indicates that the palace survived, in part at least, the Thirty Years’ War, but by early the eighteenth century it fell victim to decay and disuse. and located directly across from the Schloßplatz. The shifting influences within the Nassau family directly affected the fortunes of Wiesbaden and the palace located there. The Nassau-Weilburg line, for a time, gave way to the Nassau-Idstein line, with Count Georg August Samuel at its head, and while he recognized Wiesbaden as his capital he established his main residence at the newly constructed Schloss Biebrich, just outside the city. It would not be until the early part of the nineteenth century that Wiesbaden would see a reconstructed royal residence. In 1816, the new Duke of Nassau, born Friedrich Wilhelm of Nassau-Weilburg, arrived with big plans for Wiesbaden. The city underwent an extensive round of new construction, including a palace. In spite of initial recommendations to locate the palace in a more isolated area, Friedrich Wilhelm decided he wanted his new palace to be in a central location, so he could experience living amongst his people. As a result, Stadtschloss Wiesbaden ended up being in the Schlossplatz, or Palace Square, which is the center of the market district. Such a location, however, came with its challenges: the nearby buildings are, in fact, very nearby, and the size of the palace reflected the limited available space. Granted, the Stadtschloss is unmistakable as a palace, but it does not have quite the expansive grandeur of other such buildings. At the same time, Stadtschloss Wiesbaden fits into the area without overpowering it. Friedrich Wilhelm commissioned the architect Georg Moller in 1835, and construction continued until 1841. Sadly, the Duke would not live to see his vision completed, as he died suddenly in 1839 and was succeeded by his son Adolph I. The new Duke of Nassau, who would later also become Grand Duke of Luxembourg, moved into Stadtschloss Wiesbaden as his winter residence, reserving Schloss Biebrich as his summer residence. Conflict broke out in 1848 (the Revolution of 1848), and a crowd of 30,000 people marched to the Stadtschloss in Wiesbaden and insisted that the Duke of Nassau affirm a bill of rights for citizens. Adolph was in Berlin when this occurred, but he promptly left by train. Upon arriving in Wiesbaden, he returned to the palace on foot and without any guard, a quality that earned respect from the people of Nassau. From the balcony of the Stadtschloss he calmed the citizens and agreed to their demands. Adolph I’s reign came to a close in 1866, when the Duchy of Nassau was absorbed into Prussia, and later the German Empire. The palace came into the possession of the German Kaiser Wilhelm I, whose grandson Wilhelm II would continue to use Stadtschloss Wiesbaden as one of his summer residence. The collapse of the German monarchy in 1918 left the palace without its expected occupants, but the building continued to serve a valuable purpose following World War I. Between 1918 and 1919, the Stadtschloss housed the Workers' and Soldiers' Council. 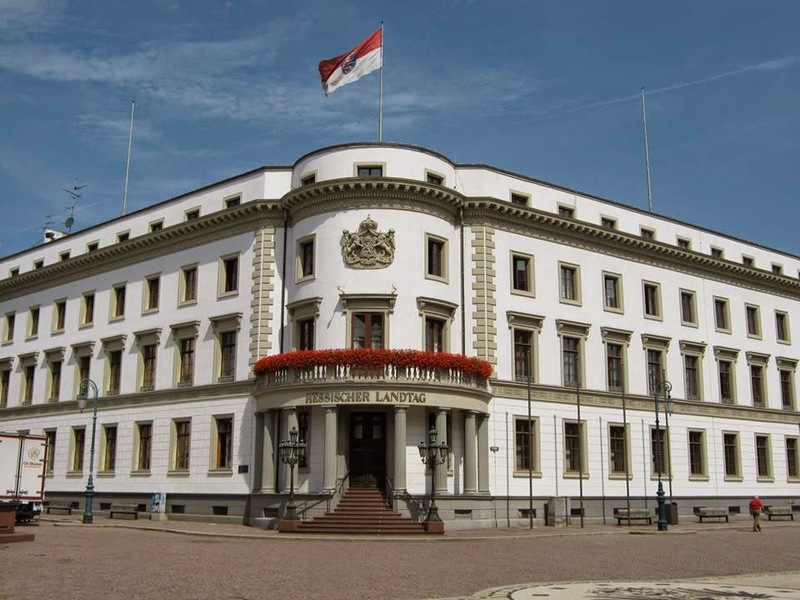 During the Occupation of the Rhineland by the Allies, the palace was home, first, to the headquarters of the French Occupation Armies and, in 1925, to the headquarters of the British Army of the Rhine. 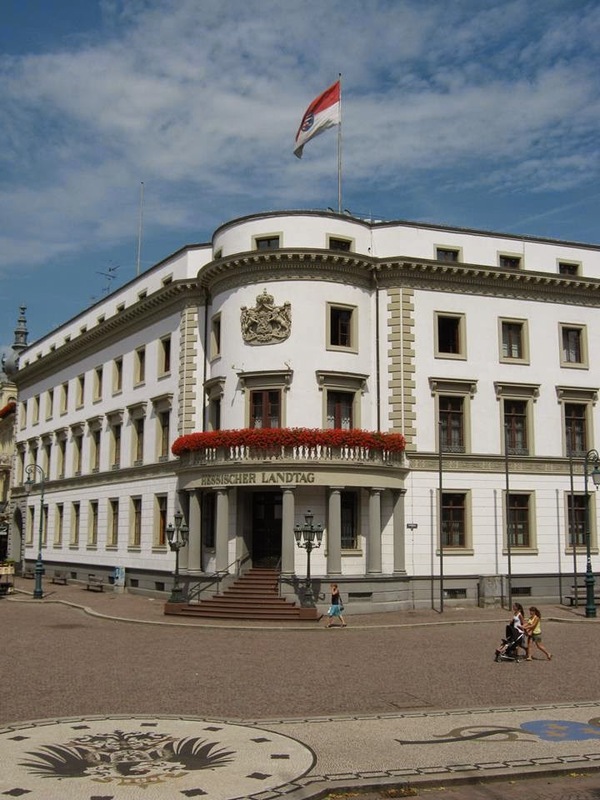 In 1930, Allied forces withdrew from Germany, and Stadtschloss Wiesbaden became a museum under the Preußische Staatliche Schlösserverwaltung, or Prussian State Administration of Palaces. The main entrance of the Hessian Landtag. The palace’s peaceful new role would not last long, with World War II already on the horizon. Military District (or Wehrkreis) XI of the Wehrmacht used the Stadtschloss in Wiesbaden as its General Headquarters. In 1940, following Germany’s success against France, Wehrkreis XI grew to absorb other regions, including the Grand Duchy of Luxembourg. After Germany’s defeat in 1945, the palace became the headquarters for the U.S. Army. By the end of the war, however, Stadtschloss Wiesbaden had lost much of its former glory. The U.S. Army moved into what still stood among the ruins of the building, with one of its entire wings having been destroyed during fighting. The State of Hesse was created in 1946, and the new government took possession of the Stadtschloss. The palace has, from that time, housed the Hessian Landtag. Significant reconstruction has taken place over the subsequent decades. A Plenary Chamber was added in the courtyard in 1959, while the state parliament continues to use the historic rooms – with many of the original items that survived the war still in them – for receptions. Some of them are also open to the public. By the 1990s, the Plenary Chamber was looking outdated, so the State floated plans for a modern facility made of transparent glass. Public outcries about both cost and suitability brought the plans to a quick demise, and the structure that was built instead reflects the stylistic character of the palace and the other buildings around the Schlossplatz. The new debating hall for the Hessian Parliament opened in 2008. The layout of Stadtschloss Wiesbaden. The architect Georg Moller had designed Stadtschloss Wiesbaden in the neoclassical style. The design of the palace is fairly simple, at least in the sense of abandoning some of the excess ornamentation of earlier eras. At the same time, it embraces an overall intention of elevated elegance. By intention, the exterior architecture of the palace fits the design of nearby buildings in the Schlossplatz. The original three-level structure was planned around two primary wings that are united in the corner with a half-cylindrical main entrance, known as the Small Rotunda. This entrance is topped with a balcony. A third wing that is angled between the two main wings contains the palace's main staircase and the Dome Hall, as well as the Mittelbau, or Middle Building, which houses the Music Room. The Middle Building creates an interior courtyard, and two of its sides are connected to the other wings of the palace with a glass-enclosed conservatory. Due to the layout, traveling among the palace's 145 rooms requires extensive walking. Connected to the Right Wing of Stadtschloss Wiesbaden are two further palace buildings: the Kavaliershaus (Gentleman's House) and the Wilhelmsbau (Wilhelm's building). The former had been constructed as a commercial building in the 1820s, before the palace's construction, but Friedrich Wilhelm purchased it to be part of the planned palace. Under the Dukes of Nassau, it was used as the Majordomo's offices. 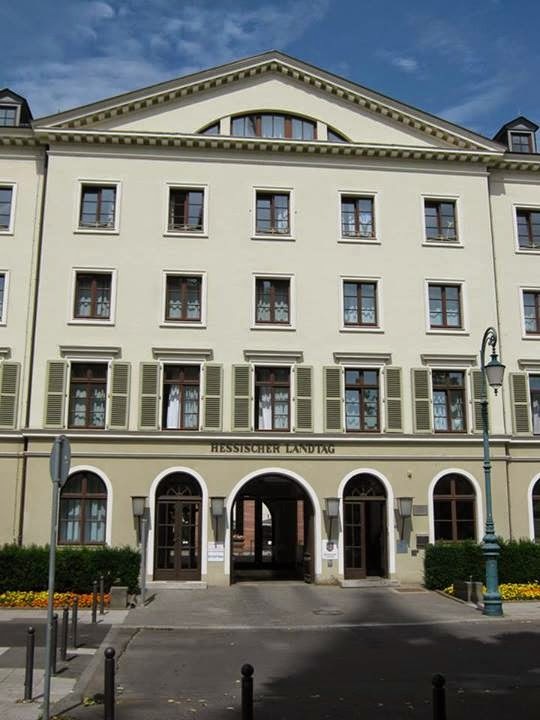 Today, it functions as the primary entrance to the Landtag. 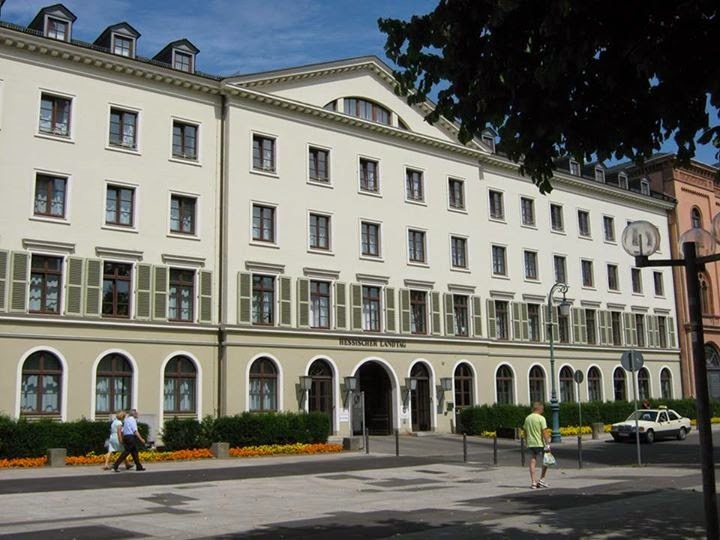 The Wilhelmsbau was built after the Prussian acquisition and became a military hospital, named in honor of the Kaiser. It too is part of the Landtag today. The interior rooms of Wiesbaden City Palace still reflect the luxury it once exuded as a royal residence. Exotic woods have been used throughout, and statues and gold-plated bronze candlesticks sit along the lengthy corridors of the two main wings. Many antique painted wallpapers still line the palace walls. The only wing that still retains original décor, however, is the left wing. The interior of the right wing faced total destruction during World War II. Within the left wing, the Red Salon on the first floor remains beautifully intact. It is decorated with red silk wallpaper, stucco marble, and ornate frescos on the ceiling. Next door is the Yellow Salon, once the breakfast room for the Dukes of Nassau; it is similar in style to the Red Salon, but it features yellow instead of red. The third wing, placed diagonally to the other two wings, has barrel ceilings and statues of ancient gods. What was at one time the dining hall is now the Dome Hall and holds skylights, as well as a chandelier that once hung in Schloss Biebrich. The glass conservatory that connects the Mittelbau to the other palace wings originally held the Duke of Nassau's prized collection of exotic plants. The Music Room within the Mittelbau is the largest room within the palace, and is currently used as a concert room. It also functions as a foyer, when the Landtag is in session.